RATE INFORMATION — The annual percentage yield is a percentage rate that reflects the total amount of dividends to be paid on an account based on the dividend rate and frequency of compounding for an annual period. For Youth Certificate, Auto2Save, and Share Certificate/IRA Certificate, the dividend rate and annual percentage yield are fixed and will be in effect for the initial term of the account. During the term of your Bump Super Saver account, you may increase the rate one time to the rate currently in effect for accounts of this type with the same term. The following additional limitations apply to the dividend rate paid on your Bump Certificate/Bump IRA Certificate account: The dividend rate may be increased to the current dividend rate offered for the corresponding Bump Certificate/Bump IRA Certificate with a maximum 100 basis point increase from the original dividend rate. For accounts subject to dividend compounding, the annual percentage yield is based on an assumption that dividends will remain on deposit until maturity. A withdrawal of dividends will reduce earnings. Dividend COMPOUNDING AND CREDITING — The compounding and crediting frequency of dividends are stated in the Rate Schedule. At your option, you may choose to have dividends credited to your certificate account, paid to you by check or transferred to another account of yours. If you elect to have dividends paid to you by check or transferred to another account, compounding will not apply. BALANCE INFORMATION — To open any account, you must deposit or already have on deposit the minimum required share(s) in a Regular Share Savings account. Some accounts may have additional minimum opening deposit requirements. The minimum balance requirements applicable to each account are set forth in the Rate Schedule. For all accounts, dividends are calculated by the daily balance method which applies a daily periodic rate to the principal in the account each day. TRANSACTION LIMITATIONS — For all accounts, your ability to make deposits to your account and any limitations on such transactions are stated in the Rate Schedule. After your account is opened, you may make withdrawals of principal subject to the early withdrawal penalties stated below. Withdrawals of dividends are not subject to penalty. For Auto2Save accounts, loan payments and certificate contributions must be made electronically. MATURITY — Your account will mature as stated on this Truth-in-Savings Disclosure or on your Account Receipt or Renewal Notice. Your Auto2Save account will mature on the date that the corresponding auto loan is paid off. If auto loan is paid off prior to original term, the account balance will be transferred to another account of yours without penalty. Amount of Penalty. For all accounts, the amount of the early withdrawal penalty is based on the term of your account. For accounts with terms of 12 months or less, the penalty will be all accrued dividends up to 90 days' dividends. For accounts with terms of greater than 12 months, but less than 60 months, the penalty will be all accrued dividends up to 180 days' dividends. For accounts with terms of 60 months or greater, the penalty will be all accrued dividends up to 365 days' dividends. In any case, the penalty will not be less than seven (7) days' dividends. How the Penalty Works. The penalty is calculated as a forfeiture of part of the dividends that have been or would be earned on the account. If the dividends have already been paid, the penalty will be deducted from the principal. Where the account is an Individual Retirement Account (IRA) and any portion is paid within seven (7) days after the establishment of the account or where the account is an IRA and the withdrawal is a required minimum distribution (RMD) or the owner becomes disabled. RENEWAL POLICY — The renewal policy for your accounts is stated in the Rate Schedule. For accounts that automatically renew for another term, you have a grace period of 10 days after maturity in which to withdraw funds in the account without being charged an early withdrawal penalty. For accounts that do not automatically renew for another term, the account balance will be transferred to another account of yours upon maturity. 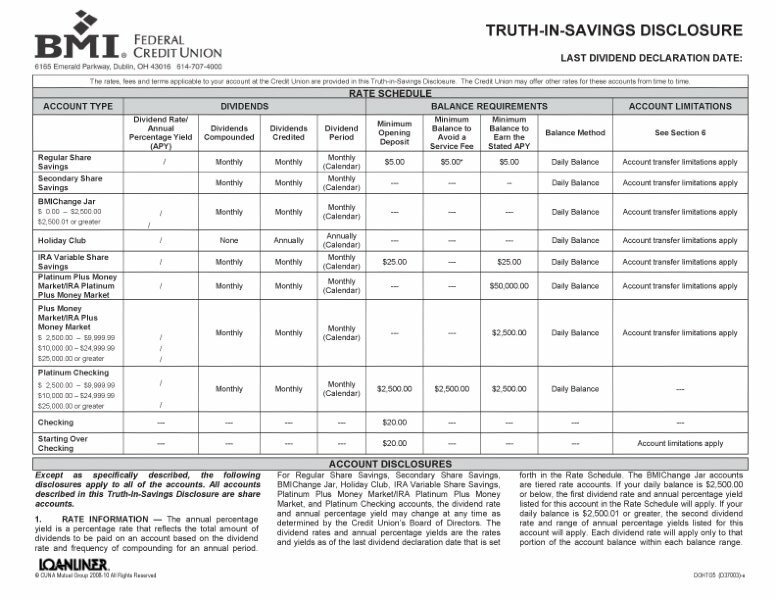 RATES — The rates and fees appearing with this Schedule are accurate as of the effective date indicated on this Truth-in-Savings Disclosure. If you have any questions or require current rate and fee information on your accounts, please call the Credit Union.